Since legal fees have become significant line items in many companies, top management at more and more companies mandates procurement to help source legal services. But where to start to consolidate cost? Improve efficiencies? Increase predictability? Monitor budgeting to get the right firms for the right matters at the right price? Whether you are new to legal procurement, need new ideas for taking sourcing legal services to the next level, or need to understand what procurement wants. 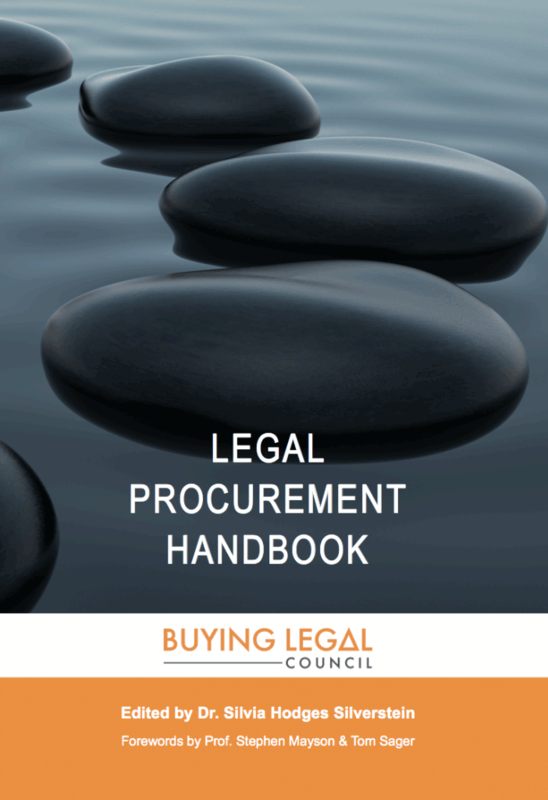 The Legal Procurement Handbook is for you. Addresses the key challenges and opportunities that buying and selling legal services creates – from relationship building and management, to financial and strategic decision-making. Is packed with best practices, practical approaches, success studies, and new legal procurement research: learn how industry experts addressed challenges and found solutions for buying and selling legal services. Answers many legal procurement questions, from which tools should be used for measuring alternative fee arrangement (AFAs), to new metrics for legal procurement, to successful bidding strategies and alternatives to discounts. Contains the insight of experts working in legal procurement and with legal procurement. It offers advice for both those tasked with buying legal services as well as those competing for work when procurement is involved. It seeks a win-win approach and encourages communication and collaboration between professional buyers of legal services and sellers of legal services. Is the must-have desk reference for the modern legal procurement professional as well as competitive law firms. GET YOUR OWN COPY: ORDER ON AMAZON OR CONTACT US FOR BULK ORDERS. This article discusses tools like Lean Sigma, project management, and process improvement that help demonstrate a law firm’s commitment to efficiency, quality, and continuous improvement. This article is based on longitudinal research on purchasing behavior of legal services in Australia. It illustrates what drives clients’ perceptions and purchasing and encourages clients and law firms to design their respective purchasing/business development strategies in a manner that co-produces more value. The author offers an alternative to focusing on discounts and hourly rates: careful scoping of matters. This approach will help legal and procurement to work together more effectively, resulting in better cost control and higher quality legal service to the client. This article offers advice for both law firms and procurement in todays competitive marketplace: it tells law firms how to deal with procurement’s playbook and when to participate in an RFP for law firms. It also offers a list of do’s and don’ts for procurement. Procurement has changed the way law firms need to market themselves and bid for business. This article leads law firms through the different stages of the bidding process and demonstrates that teamwork between outside counsel and the bid team is necessary to succeed. Managing costs is a priority for all business leaders. When CEOs bring procurement in to manage cost, the author explains that it’s critical to know procurement’s scorecard metrics and understand the value the organization places on various legal services. This article argues that AFAs need tools to measure the outcome, quality, and value of a matter or portfolio of matters. It offers different opportunities for law firms to improve the situation for both law firms and clients. This article offers ways for law firms to successfully deal with the ever-increasing number of RFPs issued by procurement: from rigorous qualifying RFPs the firm should bid on, to developing a dialogue with procurement, to measuring ROI. Negotiating rate discounts is a zero-sum game clients shouldn’t play with their trusted advisors. This article offers ways to find value that does not come at the expense of outside counsel’s margins: Effective portfolio pricing, joint matter management, and new delivery models. Such proactive collaboration takes time and effort, and should only be done with the right firms—which this article helps identify. Legal departments need to get better at budgeting and ensuring they get the right team for each matter. Procurement can help map legal spend and activities against a desired future state. This article gives insight into how procurement can help the legal department unbundle legal processes and successfully source legal process services. Procurement’s sophistication has great impact on law firms’ experience when bidding for work and on the legal departments’ peace of mind. This article compares the approaches of tactical and strategic procurement professionals and introduces category positioning frameworks as an instrument of strategic purchasing. Are my lawyers efficient? The author of this article wanted to be sure and developed a technology audit that would tell him whether outside counsel spent their time on value-added work or on wasteful manual labor that any basic, common software could do automatically, faster and (much) cheaper. Lawyers traditionally see themselves as “Trusted Advisors” to their clients. This article discusses the benefits and risks of “Trusted Advisor” relationships between law firms and clients. It explains what to do when procurement’s approach prevents such a mutually beneficially relationship. Procurement’s role has changed, but the measurement and its focus on savings have stayed the same. The article explains that procurement needs a new key performance indicator, one that can be supported by internal audit and that aligns procurement with the interests of its internal clients. Legal procurement has become a vital function to manage spend among Germany’s largest companies. This article compares the findings from two research studies (conducted in 2012 and 2014) and concludes that procurement and legal operations need to collaborate and divide up the work to achieve cost cutting, reduction of complexity, and increased efficiency. Winning business from big, prestigious clients like pharmaceutical giant GSK is rewarding, but the process may be daunting, particularly when procurement is involved. This article reveals how firms can do it successfully: Invest in your business side. Legal procurement is here to stay and only continues to increase in influence. The findings from three studies on legal procurement give insight into their role, tools, influence, background, and approach. The article offers law firms advice on how they become more appealing to clients when procurement is involved in sourcing legal services. Having worked both as in-house counsel and legal procurement officer—long before it became more common—the author combines her skills and knowledge to obtain cost-effective and valuable outside services. This article, an updated version of an article the author wrote in 1999, offers tactics for successful outside counsel supplier management. This article explains what procurement professionals want, why they want to be involved in sourcing legal services, and how they can add value. It offers a list of do’s and don’ts for RFPs and insight into procurement’s (legal) supplier management approach. Legal departments are often reluctant to collaborate with procurement because they value their relationships with outside counsel. This article offers a list of recommendations on how careful management of the legal/procurement relationship can result in great benefits for sourcing legal services. This article argues that a strong relationship between pricing professionals and procurement experts will be beneficial for both law firms and clients: financially astute and business-minded, these experts speak the same language and focus on efficiency and transparency. This article shows how law firms and clients can benefit greatly from improved partnering during the different stages of the legal engagement, from risk assessment of a matter to negotiation, budget preparation, and relationship review. This case study discusses how procurement in a multinational company was able to successfully apply cost-cutting measures to an area of legal spend. It resulted in both real savings and the desired quality of advice. It also demonstrates the importance of a well-conducted search and selection of law firms and of tracking success. This article suggests ways in which procurement can successfully approach the legal category and become trusted advisors to the legal department. It discusses basic practices that can make an impact on reducing outside counsel spend through engagement and billing guidelines, matter management and eBilling systems, competitive bidding, budgeting, and setting up AFAs. This article shows how a company selected its preferred suppliers in Japan. It guides the reader through the different stages of the process: from preparation, establishing and issuing the RFP, analysis of the firms’ responses, the personal visit to the final decision-making. This article shows how law firms can maximize their chances to win RFPs: From actions law firms can take before a company issues an RFP, during the RFP process, to after the RFP is over and the decision has been made. Legal procurement varies widely in its approach, skills, focus, scope, impact, and results. For sourcing professionals, it is important to use available tools the right way, aware of common pitfalls. Sourcing can make progress in the legal category with a thoughtful and strategic approach and appropriate resources.